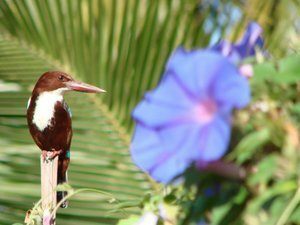 Birdwatching at The Mandala: its close proximity to tidal lands makes The Mandala a perfect place for a birdwatcher to stay while enjoying the wonderful birdwatching opportunities throughout North Goa. The Mandala Resort is an absolute paradise for birdwatchers. From the local most commonly found kingfisher, to rare owls, to ospreys and hornbills, you can spot them all with luck and patience. The few birds shown here are all local, found on our property, and for an ornithologist, the tranquility of this space combined with lush green quiet corners is a perfect haven. The number of species spotted at The Mandala is now 47! If you're a serious birdwatcher, get in touch with us to book a quiet space for an unforgettable spot of twitching.